Proudly show off your family pride with our Personalized Coffee Mug for Dad. He is certain to enjoy every sip while reading all the precious names listed on his Custom Coffee Mug. Perfect gifts for the entire family at the next family reunion or picnic. 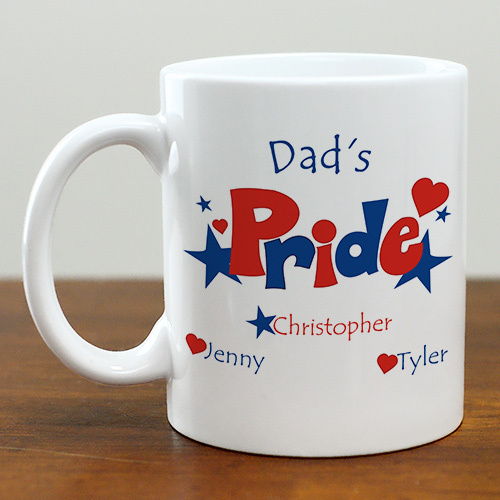 Personalize your American & Family Pride Coffee Mug for Dad, Grandfather, Mom or Grandma with any title and name. GiftsForYouNow has many Personalized Military Gifts for your favorite Soldiers. Select any of our Personalized Welcome Home Gifts today and we will personalize it for FREE. GiftsForYouNow also has a wide array of Personalized Patriotic Gifts for the 4th of July, Memorial Day and Veteran's Day.